Authors of the report found that these flaws could affect both the highly contested upcoming June run-off, as well as other elections across Georgia and the rest of the nation. 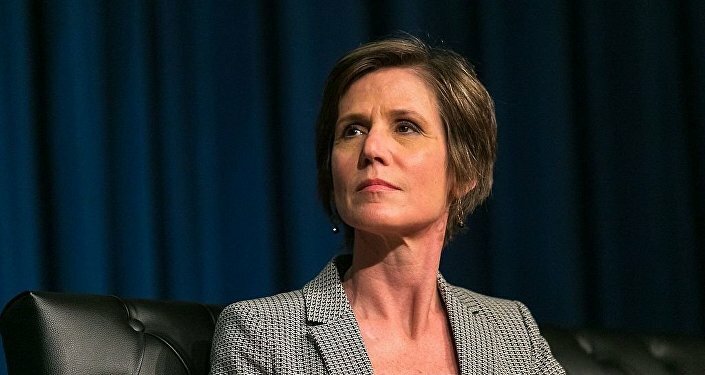 But, first today: Former Acting Attorney General Sally Yates finally testified in the US Senate on Monday about the concerns she relayed to White House legal counsel shortly after the January inauguration, that then National Security Advisor Michael Flynn had lied about his conversations with a Russian diplomat and had, therefore, opened himself up to compromise and blackmail. We cover some of her Congressional testimony today, which was still ongoing at airtime. In the meantime, voters who might wish to respond at the voting booth to the many concerns about the Trump Administration continue to face new obstacles placed in their way by new Republican-enacted restrictions on voting. Another example comes out of Iowa, where, on Friday, the Governor signed a bill to require one of a small number of government-issued Photo IDs at the polling place, despite any evidence that such a restriction would have prevented any voter fraud in the Hawkeye State. But even voters who are able to cast a vote continue to have legitimate concerns as to whether their votes are counted as cast. That's certainly the case in states like Georgia, which still forces voters to vote on 100% unverifiable touch-screen systems. On today's BradCast, Garland Favorito, co-founder of the non-partisan election integrity organization VoterGA, joins us to discuss his group's disturbing new preliminary Root Cause Analysis (PDF), published late last week, finding "critical security flaws" at the heart of the computer tabulation disaster that occurred on Election Night in Fulton County during last month's US House Special Election primary in Georgia's 6th Congressional District. Favorito, a long time career IT professional, explains the group's finding of a number of serious flaws, and his response to the state's Republican Sec. of State Brian Kemp who dismissed the problem, which halted vote counting for several hours on April 18th, as little more than "human error". Favorito also notes that, despite Kemp's promise of an investigation into the matter, public records requests have revealed that nobody has been assigned to carry out the probe as of last week when VoterGA issued their report. Favorito explains that a memory card — with results from a completely different election — were allowed to be uploaded to the GA-06 contest on Election Night, and that the GEMS computer tabulation system (used across the state, but also used in hundreds of counties in other states as well, even on paper ballot optical-scan systems) failed to prevent the invalid data from being sent to the central tabulator. "The system should have caught that," he tells me. "We found that to be almost amazing and we would consider those to be absolutely critical software flaws, that there was no validation" either at the remote location where results were uploaded or at the main database server when they were received at county headquarters. "So, basically, that scenario could play itself out again almost any time." The real concern, he adds: "a bad guy could in fact legitimately change the results of an election through fraud" via these newly discovered security flaws. When I asked Favorito whether I am right to characterize the state's Diebold touch-screen systems as "100% unverifiable," Favorito says: "You're 100% plus accurate. They are unverifiable. There is no way to detect whether or not fraud really occurred. We do not have verifiable elections in Georgia." In hopes of avoiding another disaster, VoterGA is calling on voters to request absentee paper ballots for the much anticipated and hotly contested June 20th runoff election between Democratic candidate Jon Ossoff and his Republican opponent Karen Handel, the state's former Sec. of State, in what has already "smashed" the all-time record for the most money ever spent to win a single US House election. "You could actually conduct this race on Election Night and report the results, by paper, by hand (counting), faster than you could, lugging all those expensive unverifiable machines to all the different precincts, and then going through the same upload process again just for this one race. It would be faster and cheaper. That's the irony of the whole situation," he says. There's much more in today's, frankly, alarming conversation which should be of concern not just to voters of all political stripes in GA, but all across the country, given these latest findings revealing, yet again, that electronically tabulated results can be corrupted or manipulated in a way that would be virtually impossible for election officials, much less the public, to ever detect. Little wonder the latest Electoral Integrity Project report out today from Harvard and the University of Sydney, rate US elections, once again, as the "worst among western democracies".